Q. 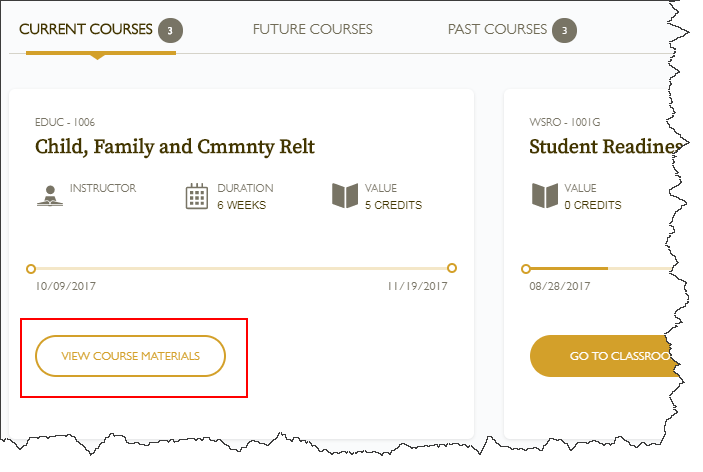 How can I order my course materials? 1. Click the link to “View/Buy Course Materials” or “View Course Materials” under your course on the myWalden Portal. You will be directed to the course listing at the MBS bookstore. All required and optional materials for the course will be listed. All available formats for the material(s) will be listed on the MBS site. 2. Select your choice and click Add Selected to Cart. 3. When you have selected all the materials you wish to purchase, click Proceed to Checkout. You will see all the items in your cart. 4. If you are ready to complete your purchase, click Check out now. 5. If you are an existing user, sign in to your MBS Bookstore account. This account is separate from your myWalden account. 6. If this is your first time purchasing books through MBS, create a new account. We recommend using your Walden email address. Remember your password for future course materials purchases. 7. Once you have logged in, follow the instructions to enter your address and payment information to complete your purchase.